Originally published under the title "Labeling of Israel and its supporters as white supremacists and fascists emerges on campuses. Bahrain king denounces Israel boycott while Canadian union votes to support BDS." BDS on campus has swiftly aligned itself with 'antifa' protests against 'white supremacy,' accusing Israel and its supporters of being racists and fascists. This shift usefully reveals the opportunism of the BDS movement. At the same time, a report by a leading anti-BDS group indicated a drop in the number of BDS campaigns on campus but an increase in their sophistication, underhandedness and hostility. The report supports the observation that BDS is only nominally about support for Palestinians as opposed to a form of organized antisemitism that grafts itself onto contemporary causes and movements. 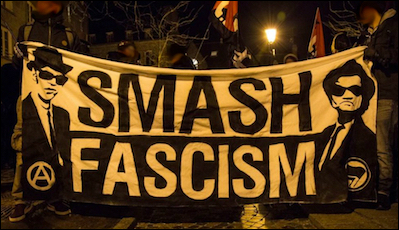 Advertising for a "Smash Fascism" rally on the campus of the University of Illinois at Urbana-Champaign declared that there is "no room for fascists, white supremacists, or Zionists at UIUC." The BDS movement was off to a quick start in September. The University of Illinois at Urbana-Champaign chapter of Students for Justice in Palestine (SJP) held a "Smash Fascism" rally on campus that announced there was "no room for fascists, white supremacists, or Zionists at UIUC." Advertising for the event stated that the "confluence of fascism and Zionism is becoming more obvious by the day" and that "two forms of racial supremacy merge seamlessly together, the Palestinian struggle for human rights and dignity can set the model for discursive changes." The statement also noted "violent resistance, whether it is a black bloc or full scale armed conflict, also has its place." During the protest itself participants yelled "no justice! No peace! No war in the Middle East! No Zionists, no KKK, resisting fascists all the way" and "no Trump, no KKK, no fascist U.S.A.!" In partial response, the university chancellor issued a statement which stated that "Painted swastikas, chalked epithets on sidewalks, KKK costumes and anti-Semitic attacks hidden under the guise of anti-Zionist rhetoric are all too common" and that "Bigotry, racism and hate will never be tolerated here at Illinois." 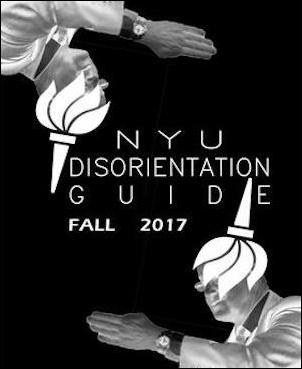 As usual, the latest NYU "disorientation guide" has a chapter on the "destruction of Palestine." Equating Zionism with fascism and white supremacy was also seen in student-made 'disorientation guides' that condemn universities for their 'complicity' in destructive 'imperial' projects. At New York University the guide condemned the school's alleged "myriad racist, Zionist, and homophobic policies," branch campus in Tel Aviv, and Birthright, which was described as "pure propaganda designed to obscure the destruction of Palestinian homes, lives, history, and culture." A similar publication at Tufts University that called Israel "a white supremacist state" and condemned Hillel was removed from official Facebook pages by the university administration. The equations of Zionism with racism and fascism come as campuses continue to be riled by controversies over free speech, and, more ominously, as evidence mounts showing substantial numbers of students and faculty believe some forms of speech are not protected and that violence against some speakers is justified. BDS support for new causes, including Trump Administration policy on Deferred Action on Childhood Arrivals (DACA) and 'DREAMers,' should be expected. Campus protests against 'white supremacy,' racism and fascism, which include harassment of speakers and the shutting down of events, follow a pattern pioneered by the BDS movement. But SJP harassment of Israel speakers at the University of California at Irvine in May has now resulted in mild sanctions from the university. The response from Palestine Legal, the legal protection arm of the BDS movement, condemned the sanctions as "a politically motivated choice to curtail the speech activities of students who stand up for Palestinian rights." Alleging violations of the BDS movement's free speech rights to engage in actions that deprive pro-Israel students from engaging in any form of speech, represents a growing trend by the BDS movement, that appears to have partial endorsement by mainstream media. The equation of BDS harassment tactics including heckler's veto with free speech is likely to grow. Hijacking campus causes is also standard for the BDS movement. After an apparently racially motivated assault near the Cornell University campus, the student government issued a condemnation. At the last moment, however, comments were added condemning the university's collaboration with the Technion, "Cornell Tech was built with the support of an institution that has led to the loss of thousands of lives in the Palestine-Israel Conflict." The comment was likely added in response to the recent opening of the Cornell-Technion campus in New York City. Another university-wide 'take a knee' protest was hijacked by a BDS supporting faculty member chanting "Free Palestine." 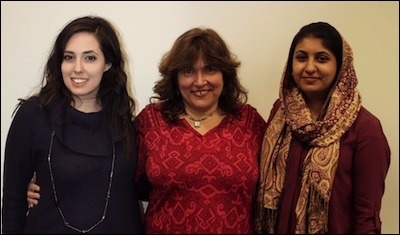 Melissa Landa (center), fired by the University of Maryland's College of Education allegedly because of her opposition to the BDS movement, poses with two former students who signed a letter protesting her termination. In an apparent case of retaliation for speaking out against BDS, a long-serving lecturer at the University of Maryland was dismissed on short notice. Reports indicate that Melissa Landa, who became active opposing BDS in 2015 and specifically at her alma mater, Oberlin College, was warned by her supervisor to discontinue those activities. The supervisor then retaliated in a variety of ways, including reassigning Landa from projects that she had developed. Landa filed a faculty grievance in early 2017 but in June the university declined to renew her contract. She plans a lawsuit against the university. The case illustrates the ways in which universities can penalize outspokenness against BDS and Israel. More positively, the McGill University student government ratified a judicial board ruling stating that BDS constituted discrimination on the basis on national origin and was thus prohibited. The University of Wisconsin student government also opened the fall semester by ordering the body's head to apologize for holding a vote on a last minute BDS resolution on Passover. BDS on campus is nominally down, but up in terms of sophistication, underhandedness, and hostility. A report from the Israel on Campus Coalition reviewed the overall shape of BDS and Israel on campus during the 2016-2017 academic year. It noted more than twice as many pro-Israel as anti-Israel events and that the number of anti-Israel events dropped by 20%, including 'apartheid weeks' and anti-Israel talks. The number of BDS campaigns also dropped to 20 from the previous year's 33. Anti-Israel programming declined in California but increased in the Midwest. The report also pointed to local efforts to rebrand BDS as part of broader 'intersectional' and human rights campaigns, as well as the usual underhanded tactics such as hijacking events and scheduling votes on Jewish holidays. Importantly, the report noted that "Although BDS activity saw an overall decline, BDS campaigns were more sophisticated and aggressive, with professional organizations investing greater resources in campus divestment efforts." The increased professionalization of BDS, through sophisticated organizing and digital campaigns, support entities such as Palestine Legal, and the focus on the Midwest, results from proximity to Chicago, which is the headquarters for American Muslims for Palestine (SJP's supporting organization) and the American Friends Service Committee's main BDS office. Chicago and Illinois are also major Arab American centers and American Muslims for Palestine has put BDS at the forefront of issues for that community. The trajectory of the BDS movement on campus, nominally down but up in terms of sophistication, underhandedness and hostility, has had an obvious impact on Jews and Israel supporters on campus. On the one hand, it is important that efforts to expose and otherwise push back at BDS have had some measurable successes. On the other hand, the impact of BDS has never been measurable strictly in terms of numbers of events but rather on long-term attitudes towards Israel and Jews. BDS has also been increasingly set in terms of 'intersectional' support for causes such as feminism and fossil fuel divestment, and opposition to 'white supremacy,' 'imperialism,' 'fascism,' and the 'resistance' movement confronting the Trump Administration. The theme of the upcoming Students for Justice in Palestine (SJP) conference "A Reimagined World: Dismantling Walls from Palestine to the Rio Grande" makes it clear that the BDS movement's co-optation strategy is expanding, regardless of the impact on higher education. In this sense the implications of the BDS movement go well beyond Jews and Israel and must be set within a larger range of 'opposition movements.' The impacts of these movements are now being measured, particularly on campuses. One result is the increased mainstreaming of antisemitism. 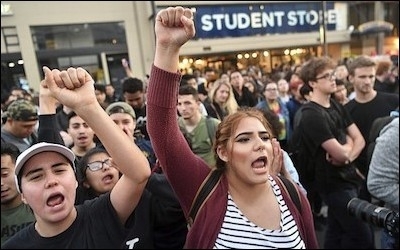 Another unmistakable result of violent campus protests in 2016 and early 2017 has been dropping enrollments and financial stresses at the University of Missouri, Evergreen State, and Oberlin. It is too soon to say whether anti-free speech protests and riots at the University of California at Berkeley and elsewhere will produce similar results in terms of enrollments and finances. But protest movements that emulated and aligned with the BDS movement have undermined the credibility and viability of educational institutions in the eyes of students, parents, and lawmakers. The impact of the BDS movement on the political sphere was apparent in Illinois, where a controversy emerged when the Democratic candidate for governor, Daniel Biss, was forced to replace his BDS supporting running mate, Chicago Alderman Carlos Ramirez-Rosa, after pressure from fellow Democrats. The controversy came as awareness grows regarding the Democratic Party's escalating hostility to Israel. This is reflected in the stances of three leading contenders for the 2020 presidential race, and from Bernie Sanders, increasingly regarded as the party's "foreign policy maven," who has now called for reducing military aid to Israel and enhancing relations with Iran. In the international arena, there were several important BDS related developments in September. Most significant were reports that the king of Bahrain would end his country's boycott of Israel and that Bahraini citizens could travel to Israel. The move would represent a major assault on the Arab League boycott of Israel that has been in place since 1945. 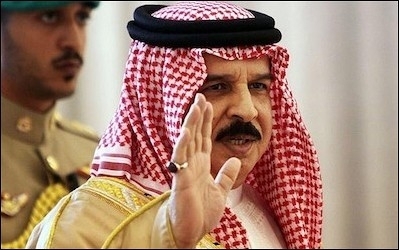 King Hamad bin Isa al-Khalifa may be preparing to end Bahrain's boycott of Israel. The contexts for the move include the growing political relations between Israel and various Gulf states, which follow up on long-standing but low-key economic relations. Equally important, however, is the role of Israel as an ally to the Sunni coalition opposing Qatar and the Iranian power structure across the Middle East. Most observers suggest full normalization of Israel-Bahrain relations remains unlikely. Less positively, Canada's largest union, Unifor, voted to adopt a BDS resolution calling for a boycott of Israel until it "implements a permanent ban on further settlement construction in the OPT, and enters into good faith negotiations with representatives of the Palestinian people for the purpose of establishing a viable, contiguous and truly sovereign Palestinian state." Another negative development was the vote to allow the 'State of Palestine' to join Interpol, which will give the Palestinian Authority a new platform to vilify Israel. The PA will also be able to issue international notices for information on individuals and to call for arrests. Individuals likely to be targeted include Palestinian political figures and Israelis. Israel and the United States lobbied strongly against the vote and condemned the results.